Hello Kitty, Pokemon, Super Mario, Astroboy… American pop culture has been invaded by big-headed, dewy-eyed characters from Japan. 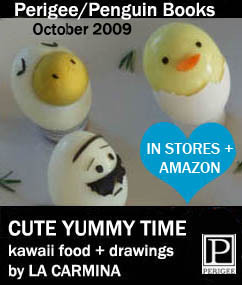 The cult of kawaii (ka-why-ee, or all things cute) has spread to every aspect of living – including food. Japan’s wackiest new trend: school lunches dolled up as adorable creatures. They’re feasts for the eyes, but the natto and nori don’t exactly sit well with Western stomachs. 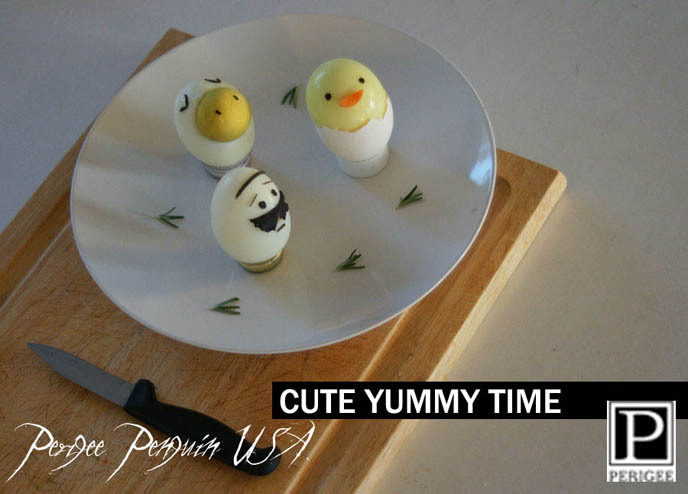 Cute Yummy Time thinks outside the bento box. Using familiar foods, La Carmina turns mundane meals into squeal-worthy sensations. A risotto ball becomes a dewy-eyed hedgehog; a cheeseball is transformed into a Nintendo blowfish. In additional to original recipes and entertaining ideas, the author’s anime drawings will appear on every page. The photo-packed, four-color paperback will came out in October 2009. 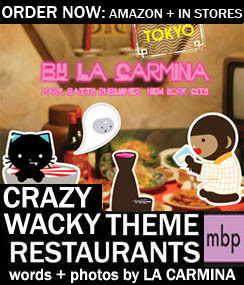 Crazy, Wacky Theme Restaurants and Cute Yummy Time are now available for order on Amazon. Thanks for the support! + ORDER THE BOOK FROM AMAZON!